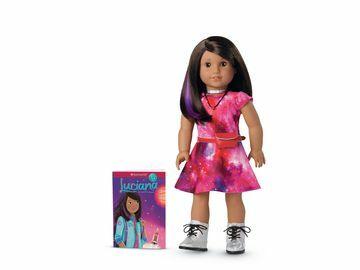 American Girl's 2015 Girl of the Year™ "Bakes" a Difference and Helps Girls Find Their Own Recipe for Success | Mattel Inc.
MIDDLETON, Wis.--(BUSINESS WIRE)-- American Girl is mixing up fun for millions of girls today with the debut of Grace Thomas™, the 2015 Girl of the Year™! Grace, an avid baker with an entrepreneurial spirit, is motivated to follow her dream of starting a baking business after an inspiring trip to Paris. 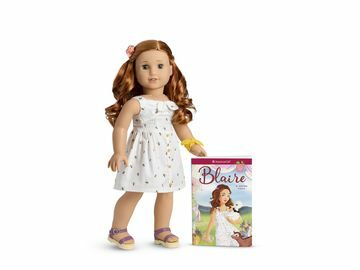 Available for only one year, the Grace collection includes a beautiful 18-inch Grace™ doll featuring long dark-brown hair and sparkling blue eyes, plus several French-inspired outfits, accessories, and toys that reflect her interests, such as the premium French Bakery Set with more than 60 pieces! The 2015 Girl of the Year books—Grace, Grace Stirs It Up, and Grace Makes It Great—written by Mary Casanova, introduce girls to an inventive, enthusiastic nine-year-old girl who is full of big ideas. A planner at heart, Grace finds the courage to step outside her comfort zone during a trip to Paris that broadens her perspective and challenges her to try new things. Back home, Grace uses her newfound courage and culinary skills to start her own French baking business with her two best friends. Learning to combine their talents, Grace and her friends mix together some great ideas that, ultimately, lead to many sweet rewards. To bring Grace's story to life, a full-length movie will debut on DVD from Universal Studios Home Entertainment in summer 2015. To further Grace's message that working together is the best recipe for success, American Girl has created For Goodness, Bake!, a year-long fund-raising initiative in support of No Kid Hungry®, the campaign to end childhood hunger in America from Share Our Strength®. Starting January 1, American Girl is encouraging girls to host charity bake sales in their local communities and donate proceeds to No Kid Hungry. Because 1 in 5 children struggles with hunger in the United States, American Girl is helping ensure all children get the healthy food they need every day. For every $1 a girl raises, No Kid Hungry can connect a child with ten additional meals. To kick off the initiative, American Girl has donated $50,000 to No Kid Hungry, and it invites customers to also donate directly at americangirl.com and at American Girl retail stores. Parents can visit americangirl.com/girloftheyear to learn more about the initiative, to register for the Bake Sale for No Kid Hungry, and be entered into the For Goodness, Bake! sweepstakes for the chance to win one of 41 Grace prize packages. In the Mix with Grace Online Journal: Throughout the year, American Girl fans will get to know Grace through her weekly "In the Mix" online travel and baking journal, located on americangirl.com/girloftheyear. The journal will feature a variety of content, including written posts, videos, recipes, photos, polls, guest writers, and user-generated content to connect girls with Grace's world. Sur La Table Cooking Classes: Starting in March 2015, girls can join American Girl and Sur La Table for Grace-themed French baking classes. The two-hour classes, offered at more than 50 Sur La Table locations nationwide, will give girls hands-on instruction on how to make French pastries. To learn more about the classes, please visit americangirl.com/stores. Grace Retail Events: On January 1, girls can celebrate Grace's debut at American Girl retail stores with the reveal of her product collection, plus in-store baking demonstrations, free craft activities, giveaways, and a photo opportunity. Girls can also take part in free and paid Grace-related events throughout the year. For more details on the in-store events, visit americangirl.com/stores. Grace Paid App and Online Play: Girls can unlock the secrets to making French pastries with Grace's exclusive paid app, Grace Sweet Shop. To learn more, search "American Girl" at the Apple App Store. Girls can also visit americangirl.com/girloftheyear for Grace book excerpts, movie-related content, games, e-cards, and much more. 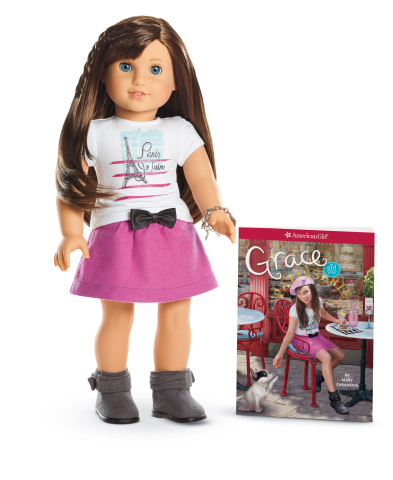 The Grace collection will be available on January 1 through American Girl's catalogue; at americangirl.com; at all American Girl retail locations nationwide; and at American Girl specialty boutiques within Canada's Indigo Books & Music stores in Toronto, Vancouver, and Ottawa. The Grace books can also be purchased through retail and online booksellers. To learn more about Grace and the Girl of the Year™ line, go to americangirl.com, Facebook at facebook.com/americangirl, Twitter at twitter.com/american_girl, Pinterest at pinterest.com/agofficial, and American Girl's Instagram page at instagram.com/americangirlbrand. To request a free American Girl catalogue, call 1-800-845-0005. No child should grow up hungry in America, but 1 in 5 children struggles with hunger. Share Our Strength's No Kid Hungry campaign is ending childhood hunger in America by ensuring all children get the healthy food they need, every day. No Kid Hungry connects kids in need to effective nutrition programs like school breakfast and summer meals and teaches low-income families to cook healthy, affordable meals. This work is accomplished through the No Kid Hungry network, made up of private citizens, public officials, nonprofits, business leaders, and others providing innovative hunger solutions in their communities. Join us at NoKidHungry.org.